At Nor-Tech, we use HPC Class Ram Memory. This memory is designed for HPC systems and is a step-up over standard “Server” memory in regard to quality. ECC memory is used to maintain reliable computational results. Registered DIMM’s are required to allow for future additional memory to be added to the system without overloading the memory buses. Nor-Tech’s memory has a LIFE-TIME WARRANTY. Nor-Tech uses Enterprise or RAID-EDITION Hard Drives. These drives provide a much better MTBF and deliver at least one order of magnitude better bit error rates. We help our customers install their applications and code on the new cluster before it leaves our facility. This allows the customer to run their applications and code and ensure everything works to their satisfaction prior to deployment, providing assurance that the cluster will be able to move into production very fast after delivery. The cluster is remotely tested by the client with their own DNS / IP addresses already set, and the cluster arrives at the client’s site with these settings already configured. Nor-Tech assists with creating and running sample job scripts and queue tree scripts are provided and configured for the cluster. Nor-Tech provides a complete set of user manuals and network topology guide, including all MAC and IP addresses. Nor-Tech provides a Visio drawing of rack layout including cabling. Nor-Tech can provide Asset Tagging and Asset Spreadsheet (Including Asset#, Serial#, Warranty info, Mac Addresses, etc) to meet our customer’s needs. 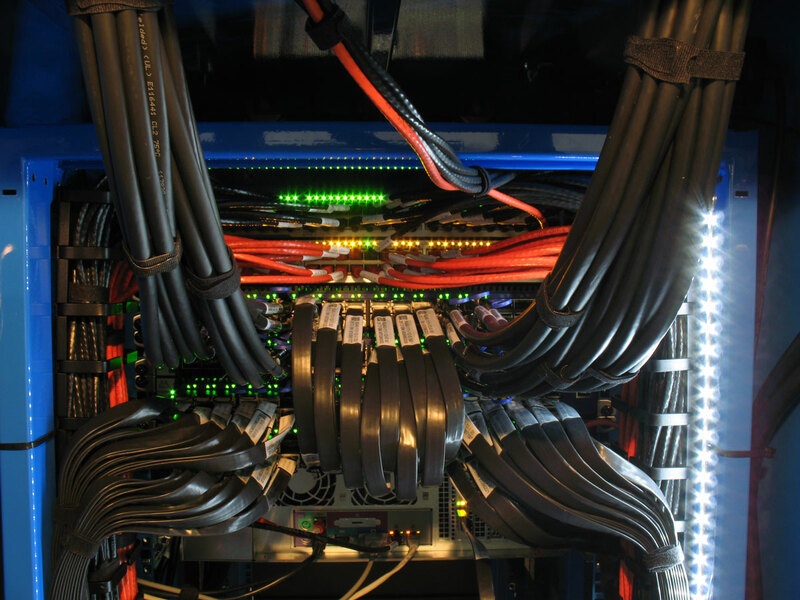 Our servers have serial numbers pre-populated in DMI for easy management. Nor-Tech labels all cables with identification tags on both ends. Nor-Tech performs a 72-hour burn-in using LINPACK prior to shipment. Nor-Tech sets up custom BIOS settings. Nor-Tech sets up and configures IPMI 2.0 and demonstrates that is is fully operational. Nor-Tech can do onsite Unboxing, Setup, Node Racking and cluster testing at client location. Nor-Tech provides a Cluster Recovery Disk. This is a bare metal recovery DVD which can include your application software and initial user and application data if those applications and data are installed prior to deployment. 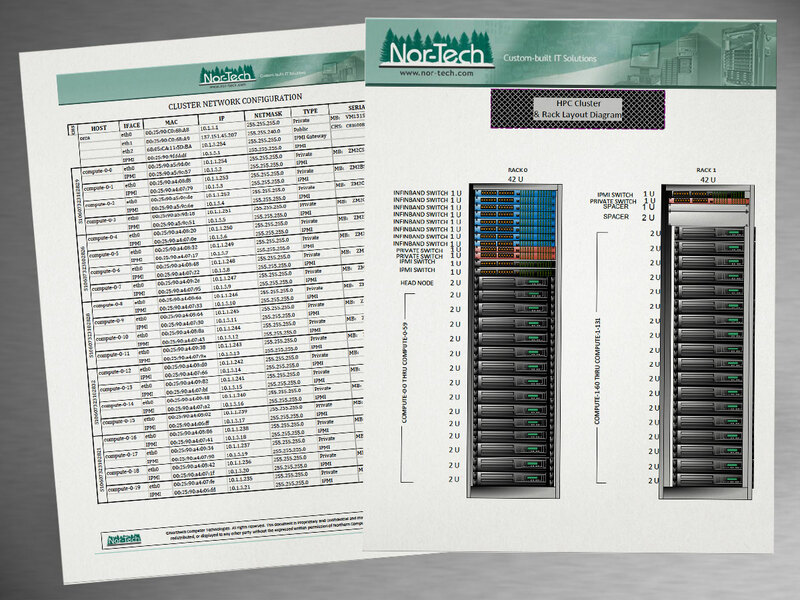 Nor-Tech provides a free Bare Metal Recovery Guide and manual. Nor-Tech clusters perform ambient temperature monitoring and reporting which first alerts administrators of excessive ambient temperatures and if temperatures keep rising then performs a graceful shutdown of the cluster. This feature can save your cluster if your air conditioning fails.